Description: $15 boxed meal from Panera on the Bluff. Broken Kettle Grasslands Preserve "4th Tuesdays"
Join Northwest Iowa Group Sierra Club members and friends for a guided visit to Broken Kettle Grasslands Preserve. 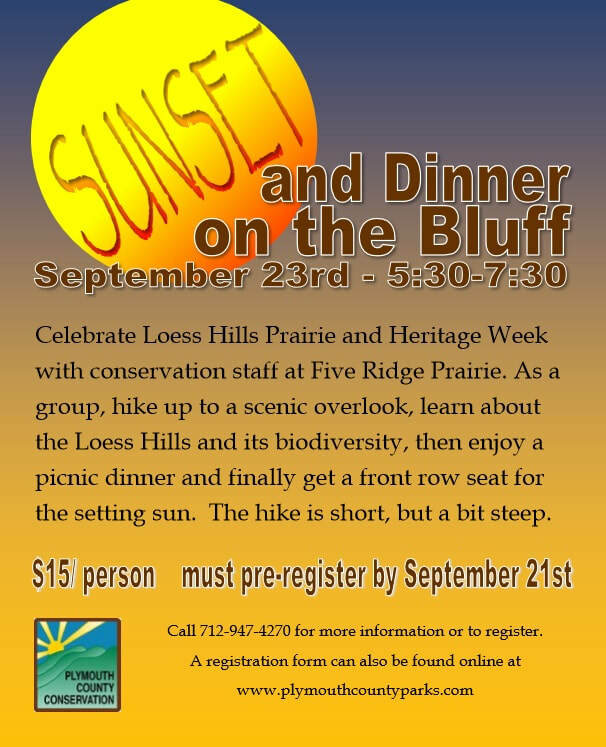 The Nature Conservancy's Assistant Western Iowa Land Steward, Dan Smith, and TNC's Loess Hills Project Director, Graham McGaffin, will lead the mobile tour, possibly incorporating a few short hikes to view bison and other featured areas. Meet at Broken Kettle Grasslands TNC office, 24764 Highway 12, at 5:30 PM or call Jim Redmond: 712-389-841 to explore carpooling to Broken Kettle. Date & Time: Thursday, September 28, 2017, 2pm – 7pm. Rain date is the next day, Sept. 29. Please call to confirm if in doubt about whether the rain date will be needed. Description: Bill and Dotty Zales are hosting their annual Seed 'n Feed. 2:00pm seed collecting party, with a light dinner for the seed harvesters at 5:30pm. Bring clippers, garden gloves and water.